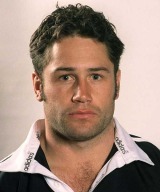 Ellis made his first strides in New Zealand rugby with Otago in 1991, making his first All Blacks squad a year later. He made his Test debut at first-five-eighth against Scotland in 1993, scoring two tries. In 1995 he celebrated his international recall at the Rugby World Cup, scoring a record six tries in a 145-17 demolition of Japan. Later that year he crossed codes to rugby league, winning caps for New Zealand in the 13-man-code, before returning to union to end his career with North Harbour, the Blues and Highlanders. Following his retirement he became a TV presenter and successful businessman in New Zealand.